What do airline initials really mean? 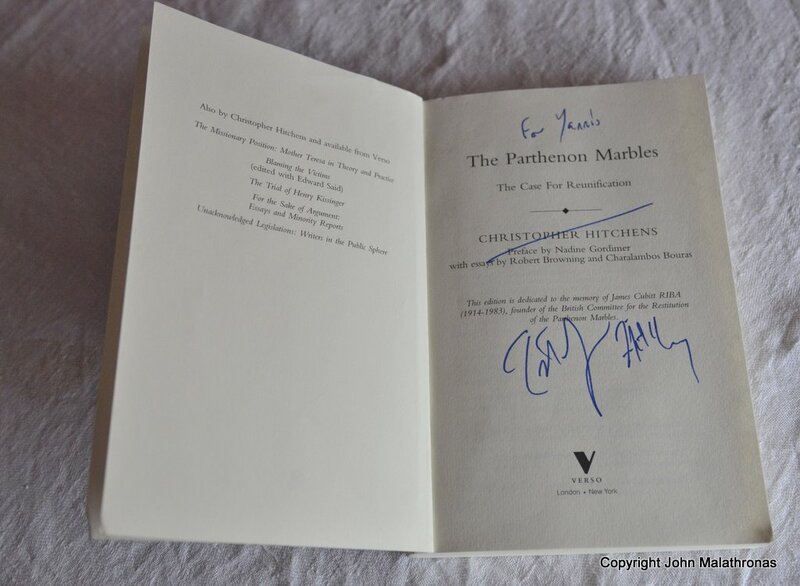 I am not one of the giants of the literary establishment who regularly consorted with Christopher Hitchens, the great polemicist who died on December 15 after a two-year battle with cancer. I am just one of the lucky ones who met him fleetingly and were dazzled by his personality. Unlike many, I didn’t argue with him. We were on the same side, because one of the several causes he espoused was that the Elgin Marbles should be returned to Greece. I met Christopher Hitchens at the press launch of The Parthenon marbles: The Case for Reunification, republished in 2008 after the opening of the new Akropolis museum in Athens, with a new introduction by ‘Hitch’ and a preface by none other than the great Nadine Gordimer (1991 Nobel Prize for Literature). The repatriation of the Parthenon Marbles as he and Nadine Gordimer call them (“They were never Elgin’s!” she angrily insisted) was one of the wars he fought against the establishment. Hitch had a long interaction with Greece; he married his first wife, Eleni, a Greek Cypriot, in a Greek Orthodox ceremony and his twenty-something son, Alexandros, whom I met (and who, I am pleased to impart, has his father’s air and presence) speaks Greek. In the book and in discussions afterwards he had an answer to every argument against restitution. That Lord Elgin removed the statues “legally“: Hitch examines Elgin’s correspondence to point out that the Sultan’s much-quoted final firman allowing the removal of the sculptures was obtained retroactively after Elgin had done his nasty work. The first firman, written in Italian, points out that Elgin was only authorised to remove “qualche pezzi di pietra” (a few pieces of stone). That Lord Elgin ‘saved’ the marbles: Hitch reminds everyone that his ship, the Mentor, sank outside Kythera and, had it not been for the Herculean efforts of local fishermen, he would be vilified as the man who lost not ‘saved’ the marbles. That Lord Elgin donated the marbles to the British Museum: Hitch points out that he took whatever he could from the government as a security for one of his bad debts. That the Greeks did not care about the marbles: Hitch records in detail the furore and bickering that has enveloped the removal of the marbles for two centuries now. In fact, those marbles that survived Elgin survived the 10-year bloody war of Greek Independence 18 years later. As one of the Greek heroes of that War , General Makriyiannis put it: “It’s because of our ancient statues that we are fighting for our freedom“. That the marbles are safer in London than in Athens. Hitch quotes in full the British Museum Standing Committee minutes of October 8, 1938: “The Director reported that through unauthorised and improper efforts to improve the colour of the Parthenon sculptures[..] some important pieces had been greatly damaged.” In fact, as we now know, they were regularly rubbed with a copper tool and cleaned with a solution of ammonia! The Athens pollution would destroy the marbles. Hitch outlines the number of careful stone restoration that the Akropolis has undergone since 1979 and that the arguments are not valid any more. The pollution was mostly cleared in time for the 2004 Olympics and the new Akropolis museum is ready and waiting. But Hitch’ best argument was the one he employed face-to-face. “How would you feel if the Mona Lisa was kept half in Paris and half in Copenhagen?” he would ask and startle you. Which is correct. The marbles were not cut cleanly or in order. An Appendix in his book shows that, say, out of the 32 metopes on the southern side representing the struggle of the Lapiths and Centaurs: I is in Athens; II, III are in the British museum; IV is in the British Museum, the heads in Copenhagen; V is in the British Museum, part of a head in Würzburg; VII in the British Museum, one head in Athens, one head in the Louvre; VIII in the British Museum; IX in the British Museum, head in Athens; X is in the Louvre; XI is destroyed; XII in Athens, XIII to XV are missing, presumed sunk with Elgin’s ship..
I’d better stop. It’s even worse with the frieze, where parts of the same sculpture – hacked in half – are in Athens and others in the British museum. For Hitch restitution of the Parthenon marbles should be “freely offered as a homage to the indivisibility of art and – why not say it without embarrassment? – of justice, too“. Hitch was one of the last great Philhellenes and Greece has lost one of her closest friends in her hour of need. Hopefully his legacy of solid arguments despite what he calls “the certainty of its own rectitude on the part of a section of the British Establishment” will do the convincing. A number of years ago I attended a conference here in Athens – where I have lived for over 30 years – on the Restitution of the Parthenon Marbles (the late Jules Dassin, the director and husband of Melina Mercouri, was a key-note speaker). I attended the conference with my wife (who is Greek) and with the typically preconceived idea that the Marbles were British. After all, we bought them legally over two hundred years ago. Didn’t we? Subsequently, I became interested in the events surrounding the removal of the Marbles by Elgin’s agents (initially from a purely academic perspective), and undertook research here in Athens and in the UK – which in turn gave me the germ of the idea for my novel – ‘The Devil’s Legacy’ – an adventure/mystery set in the present day with flashbacks to the 18th, 19th and 20th centuries – published at Smashwords.com. ‘The Devil’s Legacy’ combines a compelling and novel journey through time with the search for truth and the restoration of a country’s stolen heritage. Fiction is interwoven with historical fact to create a plausible, yet original and absorbing hypothesis revolving around a topical issue–and one I feel very strongly about–the return of the Parthenon Marbles to their rightful home in the New Acropolis Museum. Attached here is a link to an interview I have recently given to the ‘Greek Reporter’. Please rest assured that my intention here is most decidedly ‘not an attempt to sell my novel’. As an Englishman my hope and desire is that my novel may serve to highlight the need to, and justice in, returning the Marbles to Greece, and if my novel can awaken an interest in the subject, however small, then I will have succeeded. There have been many valuable publications of an academic nature regarding the removal of the Marbles, however, I have been unable to find anything fictionalising the event. I thought, therefore that this approach might stimulate interest in a different/unique way, and lead to more people questioning the issues. Furthermore, at this very difficult time for the people of Greece (and, in fact, the world), my novel is, I believe, a good – ‘thought provoking – Greek positive – escape and enjoy it – yarn’, which may bring a little pleasure to its readers. I have informed Mr. David Hill, Chairman, and Mr. Dennis Menos, Secretary, of The International Association for the Reunification of the Parthenon Sculptures that I will be donating 10% of the royalties I receive from this ebook to the Committee for the Reunification of the Parthenon Sculptures. I have always seen my novel as a way to awaken interest in like-minded people to an issue close to my heart – ‘The Reunification of the Parthenon Marbles’. a Mancunian living in Athens, Greece.